Pulled from Games Workshops What's New Today. 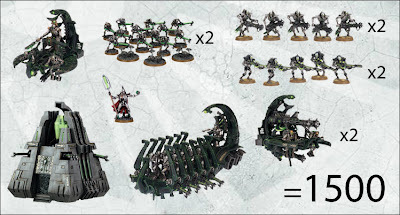 Making a 1,000 Necron army is very quick and easy. A couple of boxes of Necron Warriors make the core of the army, while the Immortals provide some heavier firepower. The Lychguard and the Overlord provide your army with some much-needed close combat crunch, while the Doomsday Ark is just plain terrifying. With this force you have weapons to deal with pretty much every situation. 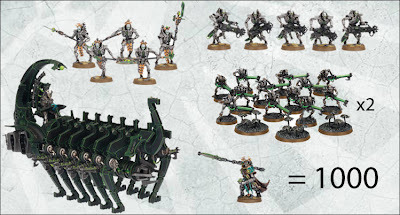 At 1500 points you can field quite a terrifying number of Necrons. In this force I opted for more guns and less combat with the intention of pureeing my enemies with heavy firepower before they even got near me. 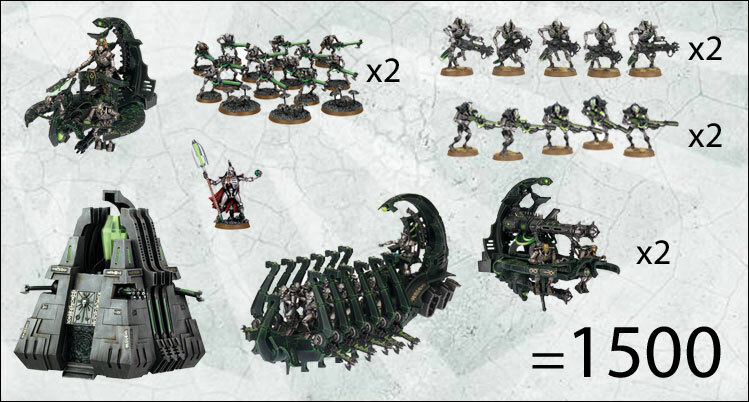 The combination of Deathmarks, Immortals and Necron Warriors will make a real mess of enemy troops, while the Monoliths and the Annihilation Barges can deal with tanks and heavy infantry.